What do you do when you want cake, but you don’t want to be tempted or forced to eat cake leftovers (slice after slice after slice) for the next week? You bake Cake Minis! I’ve created this recipe to make just enough cake to give two people their own, individual, no-share cake. My first flavor – Coconut Cream! I got inspired to bake these after that fab meal at Cafe Sunflower a couple weeks ago. I posted the preview of these awhile ago and didn’t think any one would think much of them. But thanks to all your emails and tweets, I’m happily posting the recipe for your pleasure. I’m so glad you’re as excited about these as I am! Plus, I got more than the 10-Like minimum on my Facebook post, so this recipe is going up before I go to bed. 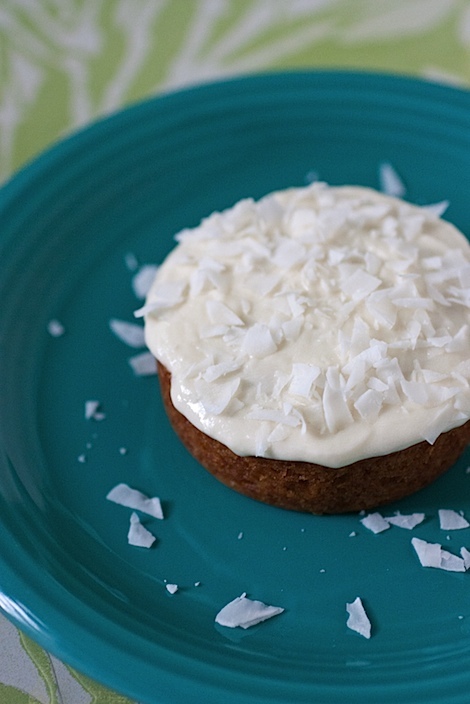 Coconut Cream Cake Mini or bust! I used mostly standard ingredients with a couple “health-food” versions thrown in, but I’ll list substitutions below. Anywho, the additional benefit is that it’s easier to portion out the “egg” amounts by going vegan. Not sure if you’ve tried it before, but it’s pretty difficult (impossible?). But flaxseed-eggs (the vegan substitute for eggs) can be made in nearly any size or amount needed. Vegan-Baking-Win! First things first, when I get started, I like to set aside the Earth Balance (or butter if you’re going non-vegan or don’t have Earth Balance) for the frosting so it can come to room temperature. And then I measured out the Earth Balance needed for the cakes, along with the coconut oil, to start coming to room temperature. Next up, mixing the flaxseed egg. I find it binds nicer if you let the flaxseed egg mixture sit for a few minutes. Actually, you need the coconut oil in liquid form, so you’ll want to warm it up just a bit in the microwave. After that, the recipe is pretty standard – mix liquid ingredients, mix dry ingredients, mix both of those mixes together, portion out, and bake. Be sure to let you cakes cool to room temperature. Confession: Ok, the first time I made these, I was a little impatient and frosted the cakes while they were still a little warm. I couldn’t resist!! The frosting melted just a bit and everything worked out just fine. But a cooler cake will get a better frosting application. 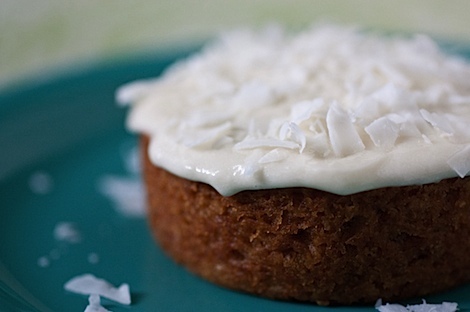 Anywho, while your cakes are cooling, you can make your frosting. 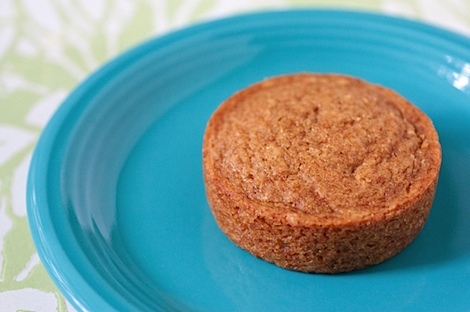 By the time you’ve baked your cakes and let them cool, your Earth Balance should be pretty easy to work with. 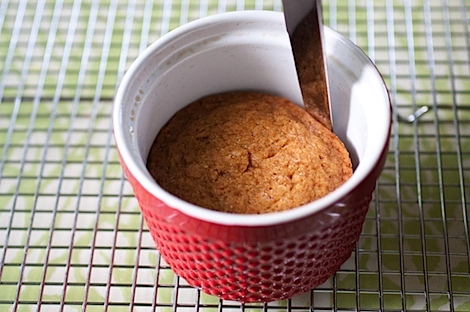 Run a knife around the edge of the cake to gently loosen the cake from the ramekin. I had to run mine around a few times before the bottom released. But there you have it…a pretty little cake. And then you’re ready to dig in! 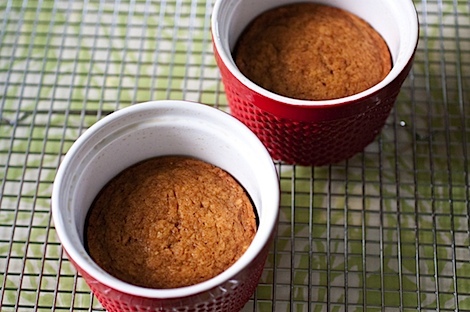 This recipe makes just enough cake to satisfy two sweet tooths or one sweet tooth twice. No more staring at tons of cake leftovers. No more feeling obligated to eat the rest of the cake lest it go to waste. Now you can make just enough for one meal and be done with it! 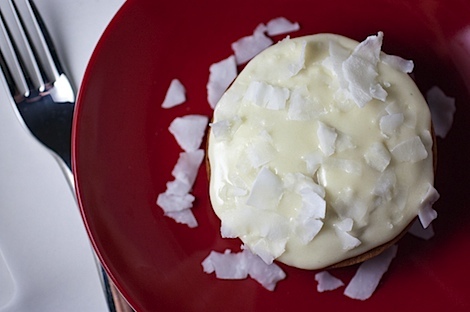 This version is lightly coconut flavored for a slightly tropical and fully tasty dessert. Pre-heat oven to 350 degrees F. Prepare two ramekins (3 inch diameter) with non-stick cooking spray. Mix flaxseed meal and water together and set aside to bind while you continue with the rest of the recipe. 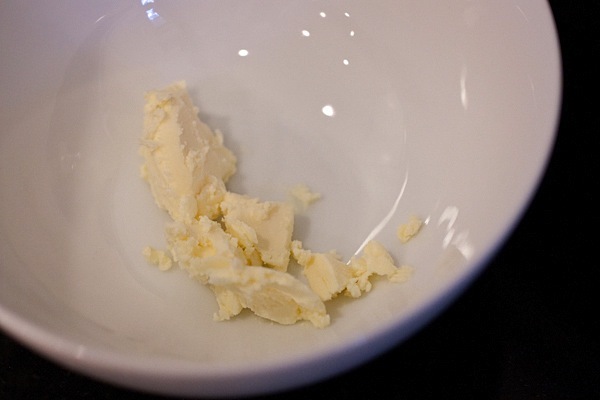 In a large bowl, whisk together flour, baking powder, and salt until ingredients are well-combined. 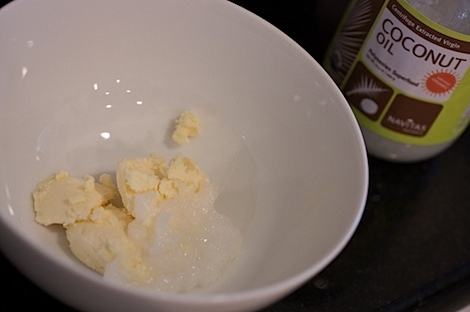 In a medium bowl, combine Earth Balance and coconut oil. 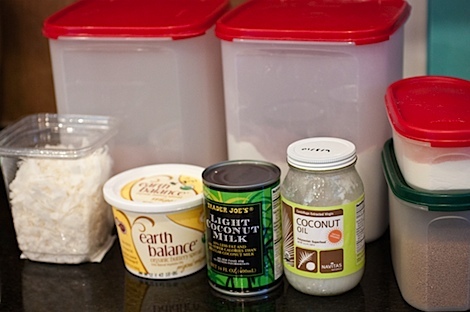 Microwave Earth Balance and coconut oil until the coconut oil just turns liquid. Stir in sucanat until well-combined. 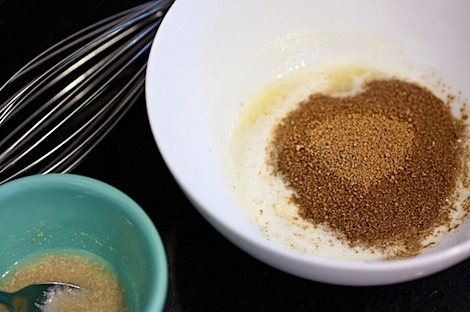 Stir in flaxseed/water mixture, coconut milk, and vanilla until well-combined. Stir wet mixture into dry mixture until just combined (careful that no flour bits remain, but that you also do not over-mix). Evenly distribute batter into the two ramekins. Bake until top is golden brown and cake is cooked through (or a toothpick inserted in the center of the cake comes out clean), about 19-22 minutes. 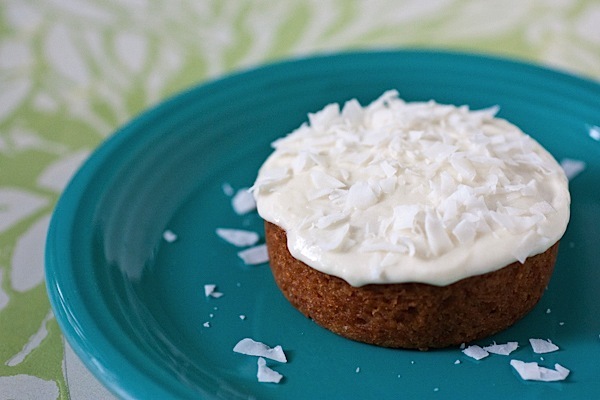 Frost cake with Coconut Cream Frosting, recipe follows, and top Cake Minis with coconut flakes. 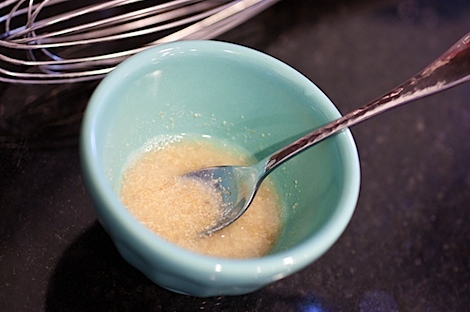 Combine Earth Balance and 3 tablespoons powdered sugar in a medium bowl. 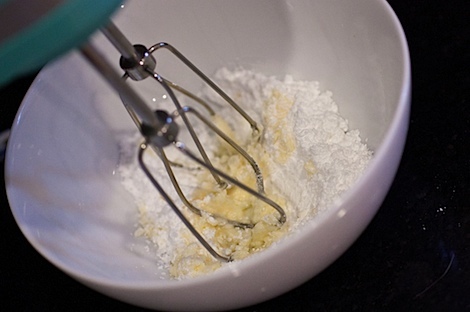 Using a handheld mixer, slowly mix Earth Balance and powdered sugar until dry sugar is mixed into the Earth Balance. Add coconut milk and last tablespoon powdered sugar. Slowly mix until dry is mixed into wet. 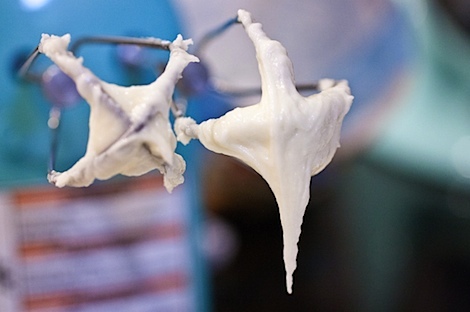 Then on medium to medium/high speed, whip frosting for a couple minutes to get it light and fluffy. Apply frosting to Cake Minis from previous recipe. I’ve tested out another Cake Mini recipe and it’s wonderful! Can’t wait to share with you guys! Yeaaa…I love my sweet tooth readers! 😉 It’s going to be fun working on some of these other flavors!! Thanks for the suggestions. What’s your current favorite cake flavor? I used to love yellow with chocolate frosting, but I’m on a big almond cake kick lately (speaking of almond cake…I should add that to the list of Cake Mini future flavors!). What about you? Mmm – this sounds great! Can’t wait to try. I’m always looking for new coconut recipes and this vegan version sounds fantastic. Thank you for sharing! These are so adorable, and they look beautiful! That looks gorgeous! 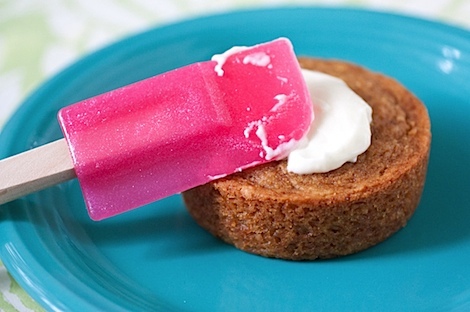 I’m the same way with frosting…I can never wait until things are fully cooled! I’m so impatient! Is it weird, though, that I don’t really like cake? I’d much rather have a brownie or a banana nut muffin any day! OMG I have the worst sweet tooth right now, this looks so yummy! those cake minis sound amazing! Looks great! Carrot cake mini please!!! Ooooh I’m definitely going to make these soon! 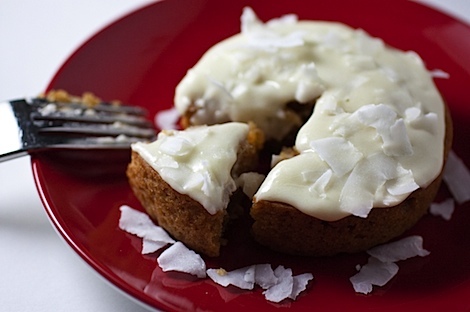 I want the recipe for the carrot cake minis! Oh my goodness! This is the best thing that could have happened to me! I can make cake without having to worry about eating the whole thing! !